When two friends, Mitchell (Duhamel) and Carter (Fogler), take a road trip together and the truck they’re in breaks down, the stage is set for a tense battle of wills – first against each other, and then against the elements as they fight to survive being stranded in the desert. Taking the basic premise that these two long-time friends are both failing in their lives and their ambitions, and are equally embittered, Scenic Route wastes no time in peeling back the layers of each character and showing them for the disillusioned, desperate people they are. Mitchell is trapped in a marriage he feels obliged to continue with, while Carter is homeless and failing to get his writing career off the ground. Both men are unable to break the chains they have wrapped around themselves. As they argue and fight over their respective failures – each summing up the other’s deficiencies – their arguments spiral out of control and become violent. To make matters worse, the stretch of road they’re on is miles from anywhere, and there’s almost no traffic. On the whole, Scenic Route is a tense, involving movie that fares better than perhaps it should. Kyle Killen’s script is punctuated by the kind of smart one-liners that nobody in this kind of situation would come up with – the two men’s initial exchanges are needlessly verbose – and one or two plot developments (which I won’t spoil here) smack of convenience rather than organic advancement. What saves the day is the committed performances of Duhamel and Fogler. Duhamel gets an extreme makeover that looks odd at first but then really suits his character, while Fogler displays a depth and range that hasn’t been evident from his comic performances. 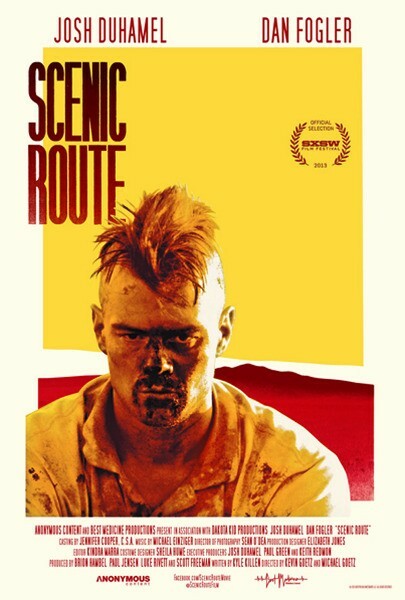 This is a tough, physical movie (shot in Death Valley) and neither actor outshines the other, making this a movie about two men who begin as equals, struggle to maintain that equality and then who learn how to survive by fighting for each other. Aside from the 1998 short Mass Transit, Kevin and Michael Goetz haven’t directed a movie before, and while this is their first feature, they keep things tightly focused on the truck and its immediate environs, placing an emphasis on keeping Mitchell and Carter in close relation to the vehicle. Even when they move away from the truck the frame remains obstinately restricted in its point of view. There are some long shots but these serve only to highlight how isolated and alone the two men are. The photography by Sean O’Dea emphasises the rugged natural beauty of the surroundings, while editor Kindra Marra ensures each scene is played out to maximum effect, including the extended coda that tries to take the movie into another territory altogether. The movie does have its faults. Some, as mentioned above, are due to the script and hinge largely on the dialogue. Developments in the plot detract from the straightforward telling of the story – a flashback proves unnecessary and distracting – and the likelihood of the final outcome will always be in doubt. The two men also seem to get by without any food or water for over three days. How much these things will detract from a viewer’s enjoyment of the movie, though, will be down to the individual. Rating: 7/10 – a modest suspenser/drama that plays well throughout and is bolstered by two above average performances; not as clever as it would like to be, perhaps, but still worth a look.